The product is mainly applicable to all types of single / three-phase, DC brushless motor stator off-line / online quality testing. A clamping, a station to complete the pressure, insulation, turn to turn, coil resistance, anti-embedded, steering and other items of detection. The product has high precision, fast test, strong adaptability, simple operation, modular design, intelligent design, easy maintenance, rich interface and so on. High precision. All the performance indicators in the industry-leading level. Test fast Single-speed single-phase asynchronous motor six test completed within 4s. Resistance, turn between the individual 0.1s or so. A set of six reverse test time is less than 0.7s. Strong adaptability. 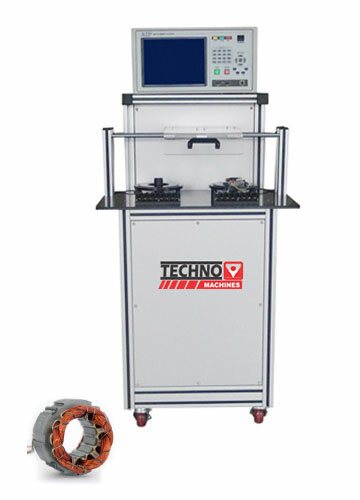 Turn-to-turn test supports interchanging test of 10uH or more coils, supporting almost all types of motors. Turn-to-turn test with voltage feedback, the impact to the coil voltage for the set voltage. Modular design. All features modular split, all modular board design, all boards are easy to install. Full electrical isolation between boards. The factory has been the tester for hardware upgrades, functional expansion, product maintenance and other simple and convenient operation. Rich interface. Instrument comes with USB, LAN, 232,485, Can and other interfaces to facilitate the control and expansion of the instrument.